Sometimes you just need a simple adrenaline rush of a movie, where chases and sturdy characters types impulsively move through a blur of suspense. David Koepp's Premium Rush hit that spot when I was seeking this kind of diversion. Driven by creative but integral visual tricks that briskly glide through New York's maze of streets, shops, and cars, this is a production that understands its meager purpose -- get the audience wrapped up in the bike messenger scene for a straightforward action-suspense film -- and pours its attention into oiling up the mechanics that pedal it forward. 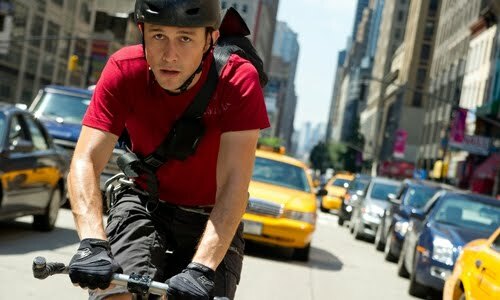 The gravitas of competition, the thrill of pursuit, and the bare-knuckled rationale behind why the riders do what they do surround an unassuming hero in rising star Joseph Gordon-Levitt, and while it could stand to focus and flesh out the substance driving its underlying conflict, it's indeed a exhilarating, polished rush. Gordon-Levitt saddles a break-free, fixed-gear cycle as Wilee, an educated and risk-taking messenger whose character mixes eccentricity and control with an urge to push his limits. Despite his work as Security Courier not current offering the most hospitable of atmospheres -- he recently broke up with his messenger girlfriend, Vanessa (Dania Ramirez), and he's vying for routes against a muscle-bound rival, Manny (Wolé Parks) -- he maintains a substantial amount of assignments due to his speed and skill in navigating New York's obstacle-heavy, car-laden network. But that's not the Wilee first seen in the film's initial scene: sweaty, starry-eyed, and hugging pavement, he's presumably knocked down due to the events that drive a time-ticker that also appears on-screen, and it's reasonable to assume that it's because of a specific job. Premium Rush starts things off by steeping the audience in the culture, similarly to the way Quicksilver does, but then it progresses towards revealing the details of that assignment. Koepp's objective becomes clear once the camera follows Wilee through New York's grid: he's out to create visually-driven suspense that gets someone on a bike from one side of the city to the other as quickly as possible, weaving through obstructions with an intuitive eye. Premium Rush showcases inventiveness when focused on the speed and danger of cycling through a city environment, focused on low-lying angles that capture twirling spokes and huffing bodies as the world blurs around them. Inventive usage of tilt-shift photography (also knows as "miniature faking") creates the illusion of a tangible map for Wilee to follow, while his phone's graphical interface logs a path to follow. And when he's confronted with obstacles, Koepp cleverly shows what happens if he were to make the wrong choices through what-if crashes. Transformers and Wanted cinematographer Mitchell Amundsen brings his style down an octave, bottling raw verve here for something quite involving. Eventually, the purpose behind Premium Rush's story does emerge, as a specific high-value package Wilee needs to deliver in a very short time-frame -- which garners attention from all the wrong sources. It's here, though, that Koepp's undemanding script skids into issues that limit its effectiveness beyond that of an instinctive bike-chase adventure. A conflict involving organized crime, child trafficking, and a gambling-addicted NYPD police officer (Michael Shannon) earns Wilee's personal investment to the situation, yet it clumsily and hastily touches on these points by doing little more than giving our rider a clear-cut villain and a complex destination. It does, however, introduce an absorbing mechanic in the middle of the time-crunched chases: several different points of view, including that of the police officer and Wilee's package-giver, reveal the situation's complexity while sustaining the element of a set, cramped time period. In a year where he caked on make-up and graveled his voice to appear as a younger Bruce Willis, and where he stiffened his demeanor into a clean-cut and idealistic copy for a comic-book movie, it's refreshing to see Joseph Gordon-Levitt let his unfiltered charisma create a character in Wilee. His role demands a confident, earthy haste in his presence whether he's riding the bike or not, trading barbs with his cocky competition or slipping back into a rhythm with his self-assured ex-girlfriend. Koepp's script keeps the dialogue bouncing between them crisp and amusing, allowing Gordon-Levitt's restrained comic timing and modest heroism to take shape when Wilee hurls himself into sprints across town, slips between cars, and takes a few necessary spills. Where the performances stumble, oddly enough, is in Det. Monday's mania -- not because Michael Shannon isn't intriguingly psychotic, which he delivers like clockwork, but because the character's wild-eyed abrasiveness feels too hefty in this slight production. Premium Rush comes together into this brisk and hearty push across New York that never really loses steam, mostly due to the skill and style behind the fast-paced biking itself. Director Koepp keeps the pulse-rate high as he mixes different types of chases -- Wilee zips through buildings, between both moving and stationary cars, and through mostly-straightaway park roads, some handled by Gordon-Levitt and others by trained stunt riders -- which embrace that sheer focus on blurred suspense through an urban environment. That raw cinematic perspective becomes its most admirable trait; while the story itself hustles along and reaches a suitable crowd-pleasing climax, galvanizing the bike messenger culture and lashing against the agenda Wilee is racing against, it's those invigorating and well-photographed races themselves which make that 90-minute time rush by. It may be slight and uncomplicated, but its textured charm and breathless, everyday danger are all it needs to successfully meet its purposes.